Apollo 1, initially designated AS-204, was the first manned mission of the United States Apollo program, which had as its ultimate goal a manned lunar landing. The low Earth orbital test of the Apollo Command/Service Module never made its target launch date of February 21, 1967. A cabin fire during a launch rehearsal test on January 27 at Cape Kennedy Air Force Station Launch Complex 34 killed all three crew members—Command Pilot Virgil I. 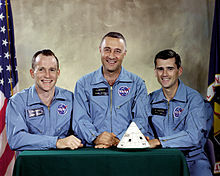 "Gus" Grissom, Senior Pilot Ed White, and Pilot Roger B. Chaffee—and destroyed the Command Module (CM). The name Apollo 1, chosen by the crew, was officially retired by NASA in commemoration of them on April 24, 1967. In 1959, NASA (the National Aeronautics and Space Administration) began working on projects where people could fly into space on specially-designed rockets and come back to the Earth. They were doing this because another country, the Soviet Union, was working on doing the same thing, and at the time, the United States and Soviet Union were competitors - they did not get along. When the Soviet Union put a satellite into orbit around the Earth, and later a person named Yuri Gagarin, the United States felt that the Soviet Union was getting too far ahead of them when it came to space. This is usually called the space race. In 1961, the earliest space program, Project Mercury, put an American named John Glenn into orbit around the Earth. Later, during another program, Project Gemini, an American astronaut was able to get out of his spaceship in outer space, an activity called a spacewalk, then get back in and come home. (The Soviet Union had already done that earlier in the same year.) While doing these things was amazing, since the Soviet Union had done them first, people still felt like the United States was losing the space race. Both the United States and Soviet Union had the same next goal in mind: to go to the Moon. The NASA program to send people to the Moon was the Apollo program. Apollo 1 was going to be the first flight of an Apollo spaceship. It wasn't going to go to the Moon - it was going to orbit the Earth while the astronauts tested and checked the equipment and machines that would be used to go to the Moon on another flight. 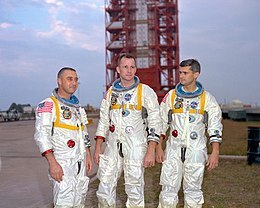 Three men were assigned to be the crew of the Apollo 1 mission: Virgil Grissom (usually called Gus Grissom), Ed White, and Roger Chaffee. Gus Grissom had been in space before, on a mission called Mercury-Redstone 4. In a tiny spaceship called "Liberty Bell 7," he'd become the second American to go into space. Ed White had also been to space before, on the Gemini 4 mission. He was the first American to take a "spacewalk," leaving the safety of his spaceship while in space and moving around outside in a spacesuit. Roger Chaffee had not been in space yet, but he was a great pilot. He had worked with the space program on the ground, helping astronauts who were flying in space. He had been the person who talked to Gemini 4 during its mission, and NASA trusted him to fly special research jets to learn about how rockets worked. Before using any equipment in space, it has to be tested. During the test, the astronauts would do everything they would do during the actual mission except fire the rockets that would launch the spaceship. That meant making everything the same as it would be during the actual mission, so problems could be found and fixed before the mission started. On January 27, 1967, the Apollo 1 spacecraft was being tested on its launch pad in Florida. All three men - Grissom, White, and Chaffee - were inside. The hatch was closed and the spacecraft was pressurized - meaning that there was more air inside than normal, which puts more pressure on everything inside. They needed to do this to make sure that the spacecraft was safe to fly in space. But rather than using normal air, the spacecraft was pressurized with pure oxygen. In normal air, oxygen is only about 21% oxygen, meaning that in a box of air, less than a quarter of it is oxygen. Most of the rest is a gas called nitrogen. In the Apollo 1 spacecraft, they were using pure oxygen: in the same box, all of it would be oxygen. During the test, some wiring made a spark, and that spark started a fire. A fire needs three things to burn: heat, fuel (something that can burn), and oxygen. In the Apollo 1 spacecraft, the air was all oxygen, and this made the fire grow very quickly and burn very, very hot. In only a few seconds, the fire was out of control. While the astronauts and the crew assigned to help the astronauts from the launch pad both tried their best to get Grissom, White, and Chaffee out of the fire, they couldn't. The pressure inside the spacecraft was pressing the hatch shut, and nobody could get it open to get the three men out. Gus Grissom, Ed White, and Roger Chaffee died in the fire. Even today, we still aren't sure just what started the fire. Engineers checked every inch of Apollo 1, and found several places that may have started the fire, but couldn't tell which of them had. What they could tell, though, was that there were a lot of flammable materials - or things that would burn easily - in the spacecraft that were near each of the possible places where the fire started. The amount of flammable material, when mixed with the pure oxygen in the spacecraft, only needed a spark to start a serious fire. The whole world heard about the accident, and all Americans were very sad about the deaths of their astronauts. Even the Soviet Union, America's competitor in the space race, told the American government how sorry they were to hear about the fire. The Apollo program itself was stopped for almost two years while engineers made changes to the Apollo spacecraft to make it safer. 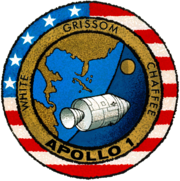 Today, there are a lot of schools, civic buildings, and other places named for Grissom, White, and Chaffee. Several memorials were built to honor their loss in the fire. But maybe the biggest legacy, or way they have been remembered, of their deaths is the change that happened in the space program: since the Apollo 1 fire, there has never been another fire in an American spacecraft - engineers learned that very painful lesson during the fire in Apollo 1 and have done everything they can to make sure another fire can never happen. ↑ Ertel, Ivan D.; Newkirk, Roland W.; et al. (1969–1978). "Part 1 (H): Preparation for Flight, the Accident, and Investigation: March 25 through April 24, 1967". The Apollo Spacecraft: A Chronology. IV. Washington, D.C.: NASA. LCCN 69060008. OCLC 23818. NASA SP-4009. Retrieved March 3, 2011. This page was last changed on 31 August 2018, at 14:59.